When the Charleston Post And Courier wanted to expand their TV listing book offering, their internal team partnered with FYI Television to make things happen. About The Charleston Post And Courier. As one of the most respected newspapers in the South, The Charleston Post And Courier owes its readership the fullest experience possible. The paper chose to maximize its TV listings book as a way to provide better content to its readers, while improving ROI for the paper’s efforts. Due to the consistent downsizing of the newspaper industry—without any downsizing of reader’s expectations, the Post And Courier needed a way to improve its offering, increase its subscriber base, and raise the opt-in price for the expanded TV book offering. In other words, the challenge was to expand the offering and increase the price—without driving away any current readers. True Collaboration: A Partnership In New Product Development. In this digital age, traditional newspapers are constantly searching for ways to improve the content they provide readers, without adding additional costs to provide that improved content. Oh, and it would be even better if the new and improved content could positively impact the paper’s ROI. Sound daunting? Perhaps. But FYI Television’s John Dodds had a solution. The FYI New Product Development process. As part of the newspaper’s transition team, FYI involved at all steps in the process to inform, suggest, and advise. The result was a free-flowing process that kept all parties informed and engaged. The newspaper’s knowledge of their processes and their readers combined with FYI’s new product and launch expertise. Increase in subscribers. Subscribers drive revenue, so adding them is always a must. But, when you can add them by leveraging a current content offering? 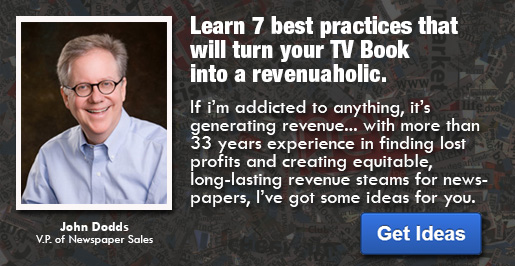 And when you’ve added 19.5% more subscribers with your new TV book? That’s great news anywhere. Increase in opt-in pricing. When the Post And Courier went from their TV Week book to the expanded TV Week+, then also doubled the opt-in price, they were concerned that the increase in price might result in a drop in subscribers. Not in this case. By providing a quick and affordable pre-development reader survey the newspaper and FYI delivered just what the audience wanted. Increase in annual circulation revenue. In just those first three weeks since the transition, the newspaper is anticipating an increase of nearly $50,000 in annual circulation revenue. Clearly, the transition team knew what their readers were looking for. And they delivered.